Here at DB Sports Tours we are delighted to announce the details of a unique opportunity to inspect the facilities at our partner’s facility at Futbol Salou, Barcelona. Here lies an opportunity for you to see how Ireland’s best sports tours operator hopes to improve the level of football coaching in Ireland. The three-day trip will illustrate to you how the state-of-the-art facilities can prove crucial in the development of your players. Based in Salou, the Futbol Salou Sports Complex is headed by UEFA Pro Licence coach Albert Vinas, formerly of RCD Espanyol and previous tutor of FC Barcelona Head Coach Tito Villanova. This is an opportunity to evaluate your risk assessment, familiarise yourself with the resort and the excursions. Furthermore, we hope you will use the time to check out the facilities and accommodation, take photographs and make preparatory notes in advance of your team tour. 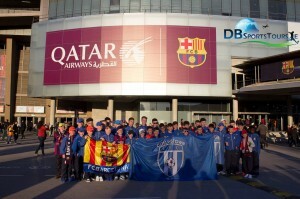 Your weekend package will include two nights accommodation with full board, transport to and from the airport, tickets to an FC Barcelona match, viewing a youth Spanish team play or train, and various leisure activities to be discussed at a further date. Please not the package does not include flights. Our sports tours are designed to ensure you get value for money; we plan on providing your team with a memorable and valuable experience. For example, your team will get to undergo a master class training session. The Master class offers teams, players and visiting technicians the opportunity to familiarise themselves with the Catalan and Spanish football philosophy. Elsewhere, we ensure our team tours are brought to you in comfort; your team will stay in the luxurious Cambrils Park Resort. Cambrils Park Resort is a first class bungalow park with the best of modern comforts and services available on the Costa Dorada. Within the park all your essential amenities are readily available; including a supermarket and three pools. Leisure activities are key to ensuring our sports team tours are of the highest standard. You will have the opportunity to not only visit an FC Barcelona game, but take a guided tour of the famous Camp Nou stadium also. Not only that, our team tours also provides the opportunity to visit the Port Aventura theme park. Situated barely 3km away from the Futbol Salou Sports Complex is a must for those who love the thrill of adventure. We would love to hear from you today to register your interest in taking up this opportunity to inspect the facilities for our Barcelona Coaching Clinic.